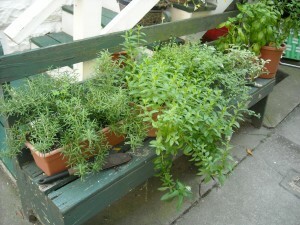 I grow my herbs in pots outside of my back door, by my kitchen. Although there are about 100 species of sage commercially available in the united States, the one that makes it into the kitchen is probably Salvia Officinalis, a shrubby plant native to the Mediterranean. Growing to almost 2 feet high, it has gray-green leaves. 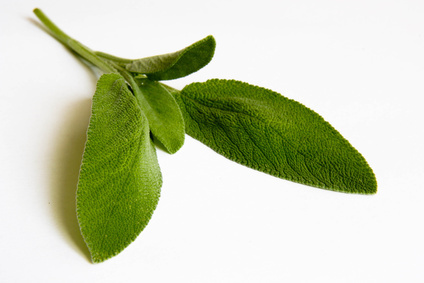 Whereas Sage in not used in French cooking much except in Province, Italy seems to use it more, especially in sauces with pancetta or prosciutto. England may have embraced sage most of all, as in sage Derby cheese. Sage is an aquired taste, but both cultures know about stuffing. We celebrate our Thanksgiving holiday with sage stuffing filled turkey, the Brits celebrate Christmas with a goose filled with sage stuffing. Cook bacon over medium heat until crisp. Using a slotted spoon, transfer bacon to paper towel to drain. Pour off all but 1 1/2 t. fat. Add sage and saute 1 min. Add the water or broth and increase heat heat to medium-high and bring to a boil. Gradually whisk in cornmeal. Reduce heat to low and cook until it begins to thicken, stirring frequently for about 20 minutes. Stir in cream, cheese and bacon. Season with salt and pepper. Melt butter in skillet and brown sugar and cook over medium-high heat until bubbly. Add sage and cook until crisp. Can be used as a garnish with chicken and fish. Deliciously sweet and savory.